Thank you Visme for the opportunity to share this and involve my students in this blog post. Projects are one way that teachers can assess students throughout the year. Regardless of the theme, students have a lot of opportunities today to complete their projects using a variety of presentation formats. They have more options for showing what they have learned and how they can apply the material covered in class. With each passing school year, the options available to students increases, enabling each student to find and work with a digital tool that is personalized to them because it meets their interests and needs, and also their comfort level with technology. While using tools such as Microsoft Word or a standard PowerPoint to create reports and presentations provides students with a foundation for learning technology skills, taking their knowledge of these formats and applying them to new technology tools can maximize their learning in many critical areas. 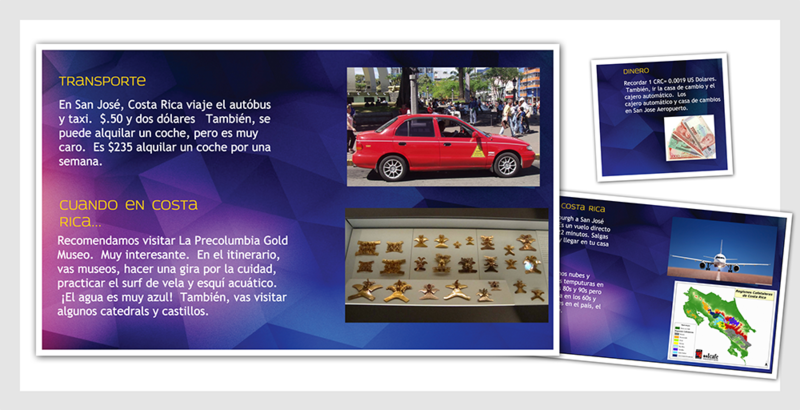 Depending on the type of project or assignment that a student must complete, tools such as Visme offer many options to users who want to create any type of project or presentation with a single multi-tool that integrates multimedia and many other visual elements. As a foreign language teacher, for example, I often want students to include an audio component to their project so that I can assess their speaking skills. 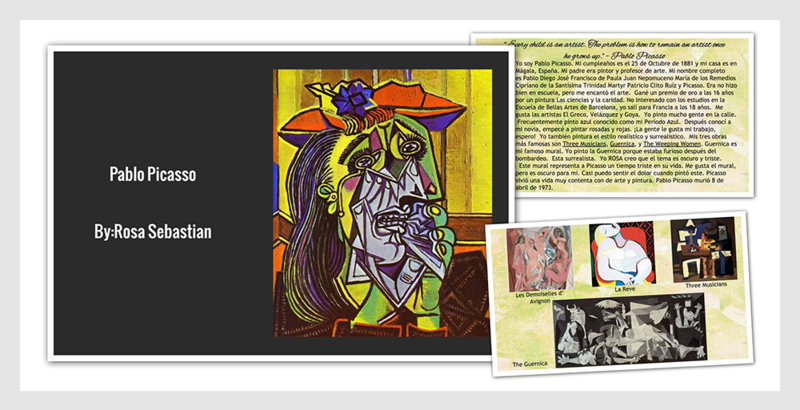 A recent example of this is a project I assigned to Spanish III students which entailed describing the life and work of an artist. 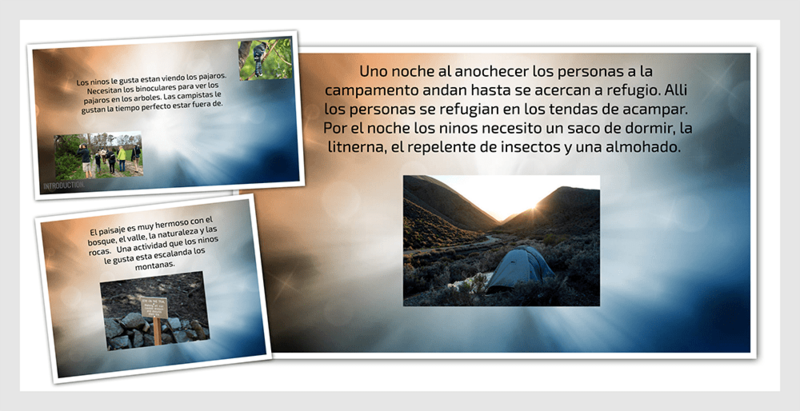 The project required a certain amount of vocabulary to assess their Spanish language skills, but it also had to include images or video and an audio narration with their comments on the project. Whereas in the past, they may have needed to use two separate digital tools to do this, depending on their choice, they can now rely on Visme to create their projects with all of these elements in one presentation. There are many choices as to the type of format, whether it be an infographic, flyer or a presentation. Each of these have options to include multimedia and many other choices for audio, video, and other visual representations. With the new updates, these choices are even greater than they were for our prior student projects. There are a lot of tools available which integrate various components, enabling students to record audio or upload audio files into their presentation, but these often require multiple steps, or specific formats, and in some cases may require advanced knowledge of technology. However, with the recent addition of Visme’s new audio feature, students only need to look to this one tool to create their presentations. 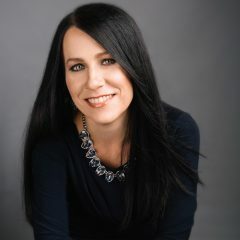 They can add their voice-over directly into their project with just a few clicks. 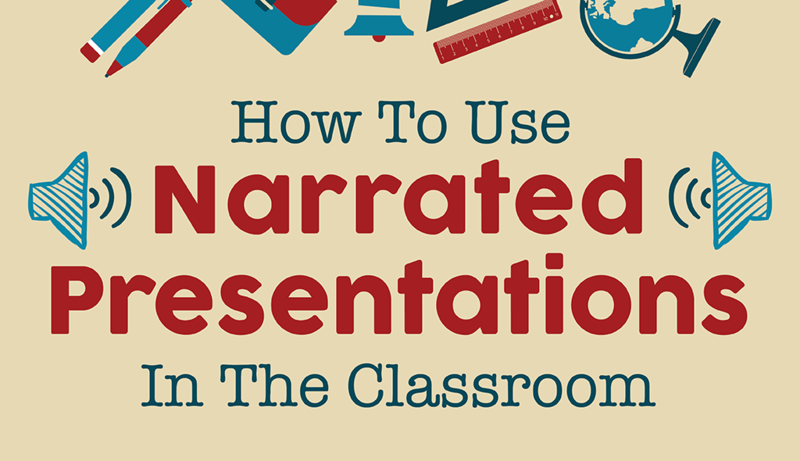 There are tons of possibilities for using audio in presentations. 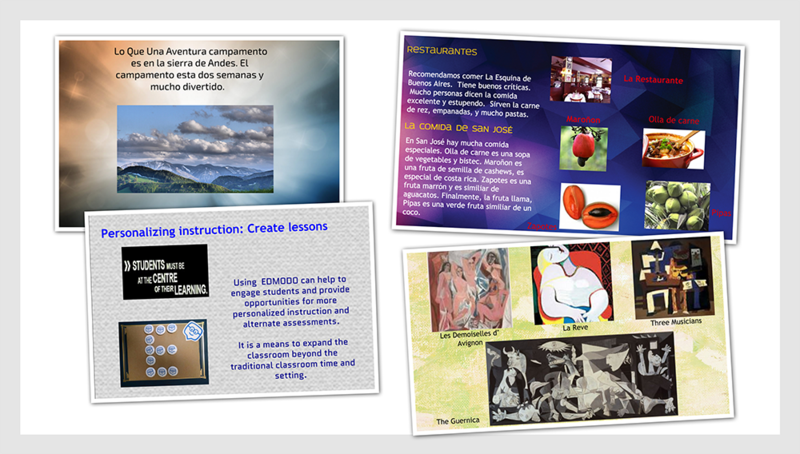 As a teacher, I can create lessons for my students, with instructions on each slide, to guide them through the presentation. This is a great option for students who are absent from class or who would like to revisit a specific lesson. I can also teach a lesson and explain grammar, vocabulary, culture, or any topic we are covering in class, and easily add the recording to the slide, making it easier for the students to follow along. The potential for this is huge, especially in flipped classrooms, or blended learning environments. 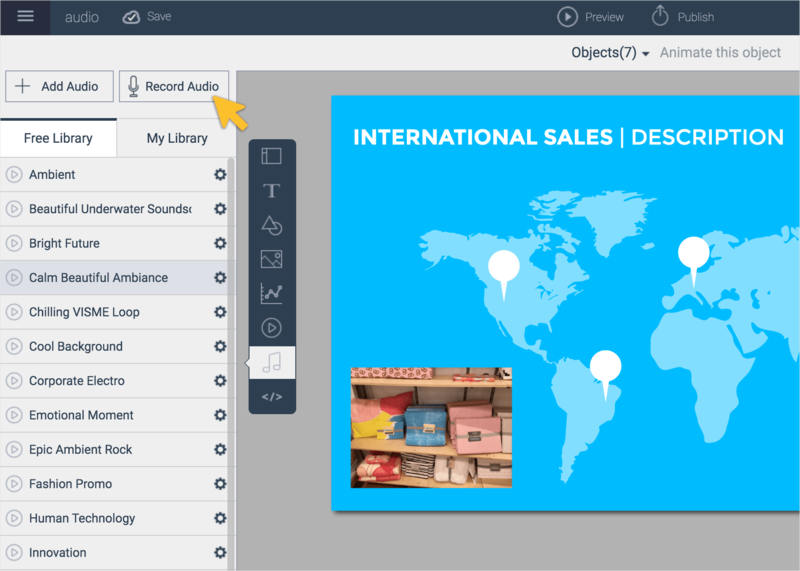 Anyone who creates a presentation, regardless of whether it is for use in an educational setting, can take advantage of the audio component of Visme, to really add that something extra to the presentation. It can be a recording of one’s own voice, or it can be other audio that has been added in from the library or uploaded from another source. There really are a lot of possibilities for enhancing anyone’s presentation. What Can Students Do With This? Students were excited to use Visme’s audio feature for recording voice overs and creating narrated infographics and presentations for our class. Some of the students shared their opinions of Visme’s audio feature. From a student’s point of view, presenting information to classmates can be a bit scary, and rather than speaking while displaying the presentation, the students can pre-record their information, and let the presentation run on its own. This is a great way to help students gain confidence in the classroom and keep comfort levels in check. It is also a great way to have presentations available for sharing with peers and for use as a resource for future classes. Teachers can benefit by being able to record their own lessons, but students benefit by having everything they need to create highly visual and engaging multimedia presentations. Visme simplifies presenting and storytelling for you and your team.